Hello friends! How’s everyone’s week been going till now? I hope you are having your best summer life yet, at least I know I have. 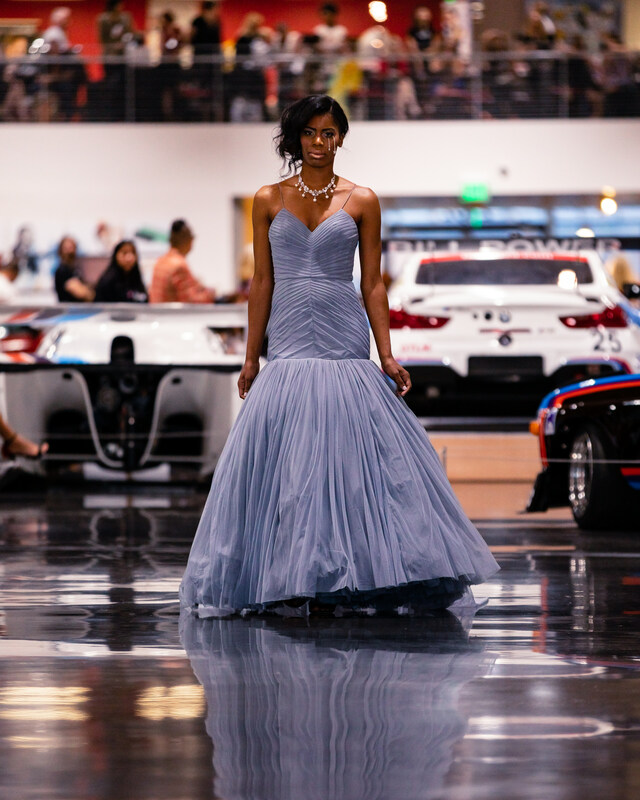 This summer has been super busy with fashion-related events, and that is the reason why today I want to talk to you about the latest one I attended just a couple weeks ago, called Couture and Cars 2018. But first, I want to talk about another event that day, and a little collaboration the Seattle Gents and I did with an accessory company from British Columbia called Wolf Clothing Co. So let’s get started! First of all, how many times have you completed choosing your outfit but you still feel that it needs an extra pop to be complete? Sounds familiar? Well, a really good way to turn that extra notch on a look can be by pairing it with some colorful socks. That’s where Wolf Clothing Co. comes to play a very important role. 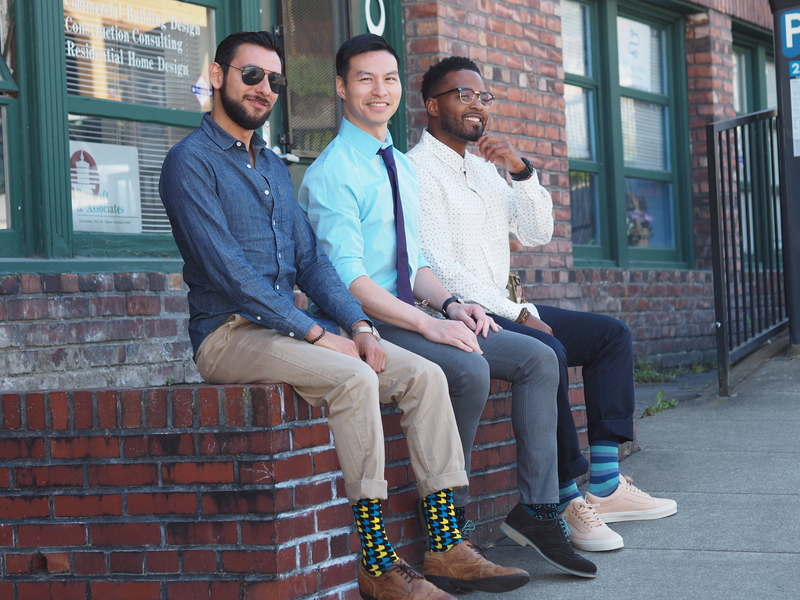 This Vancouver-based company creates colorful, interesting designs on socks every man can wear with almost any outfit. The Gents and I were each offered a pair of these to try for our outfits, and you wouldn’t believe how versatile they were. 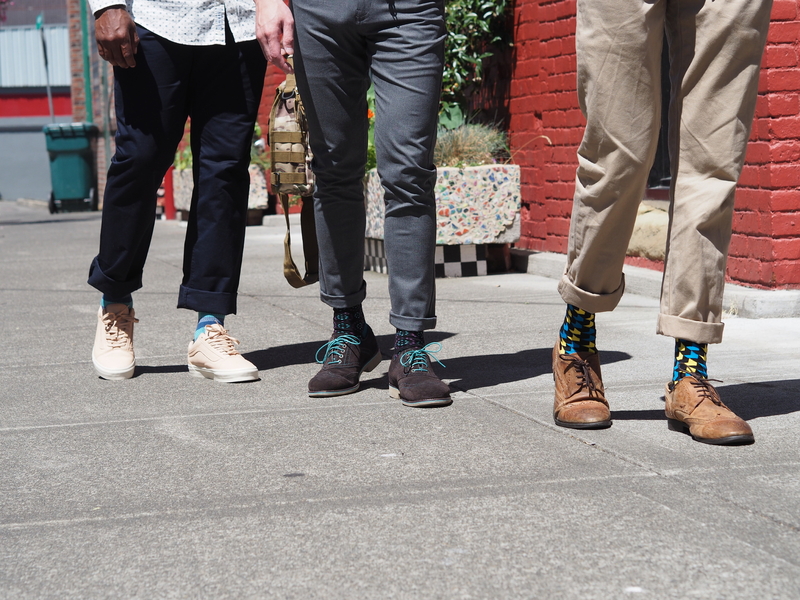 Whereas you’re wearing a denim shirt and slacks, or a button-down with a nice tie, or even with the most stylish pair of sneakers, these socks will accentuate your personality while also making you feel very comfortable. So after a stroll through downtown Tacoma in our brand new pair of socks, the Gents and I attended the Couture and Cars event a the LeMay Car Museum near the Tacoma Dome. This event, which by the way is its second year in a row that it takes place here, looks to pair up both fashionistas and car aficionados in a very unique combination of fashion, style, and motor vehicles. It consists of a runway show featuring some of the most popular fashion designers in the Pacific Northwest, as well as a post-show mixer in a truly magnificent venue. This year, 5 clothing designers and 3 accessory designers got to delight us with their collections, and here’s a small recap of some of my highlights during the show. Since I was a VIP guest, I even got the chance to witness the backstage, where hair and makeup was being done on the models, and I also got the chance to talk to a few of the models and the designers. It was an awesome experience, and thanks to my friends from Fashion District NW I had a really good opportunity to get a closer look at the pieces. 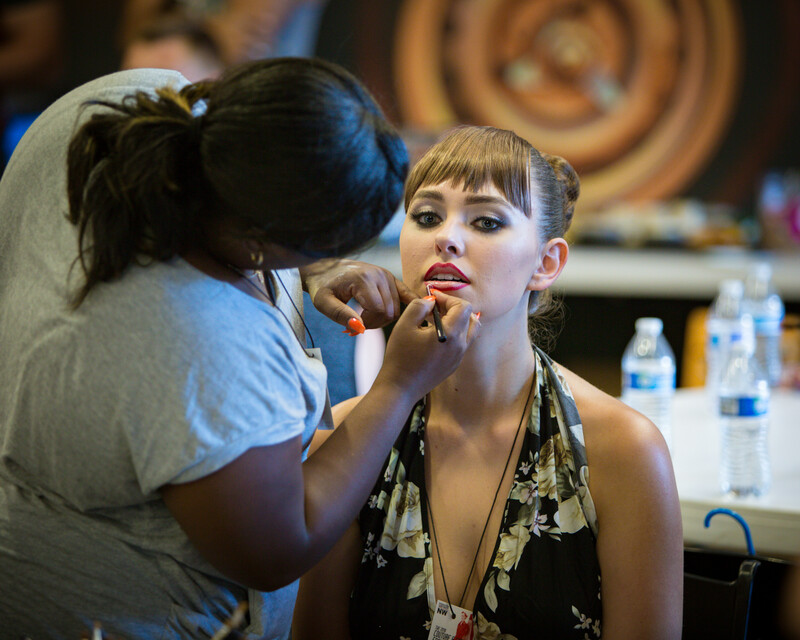 The show started with one of my favorite designers in the PNW, Chany Venturini. You might remember her for being the crowd’s favorite designer at the Independent Designer Runway Show last year during Bellevue Fashion Week. When I saw Chany was in the lineup for this year’s show I was super excited. You see, she’s a designer that loves creating fashionable pieces for the modern woman, and she takes risks by showing both the strength of her models and their confidence through the boldness of their clothes; similar to what an armor does to a soldier, but in a very beautiful, feminine way. So the show started with a bang, and we got to see some pretty luscious designs in gold and black, along with some sheer gowns and gorgeous translucid garments. My favorite thing about this collection was how cohesive it was, and here in the pictures you can see of the detail that’s been put into these outfits. It was a statement of feminine power, and overall, the perfect way to start the show. Next in line, we have Dawnamatrix along with our first accessory designer, Ann X Ann X Design. I had previously seen her in other fashion shows, so I knew from the start this this was going to be a fun ride. It’s incredible to see how Dawn, the main designer of this brand, has elevated her own work throughout the years. She still uses latex as her main material in all of her creations, but you can hardly tell this is latex by how well it has been worked out to fit the model like a silk glove. I really like how bold her designs are, and the jewelry provided by the accessory designer looked like it was custom made for these wonderful dresses and body suits. One of my favorite looks was a white-and-black gown with black gloves and a flock of birds print. Here you can see how the necklace really accentuates the whole look, and gives it a pop in a dress that we thought was already bold enough! Props to both of them and I can’t wait to see the evolution of their style and clothing because it’s been a wonderful ride to witness. Our next designer was Designs by THOR, and here we got our first peek at menswear during the whole show. The House of Rose (THOR) is a brand that stands out for their exquisite, classic designs of full suits and jackets for both men and women. Tony Iyke is the Nigerian creative director besides this Portland-based house, and his passion for designing unique, bespoke pieces that are both classy and distinguished is something that he takes pride of. 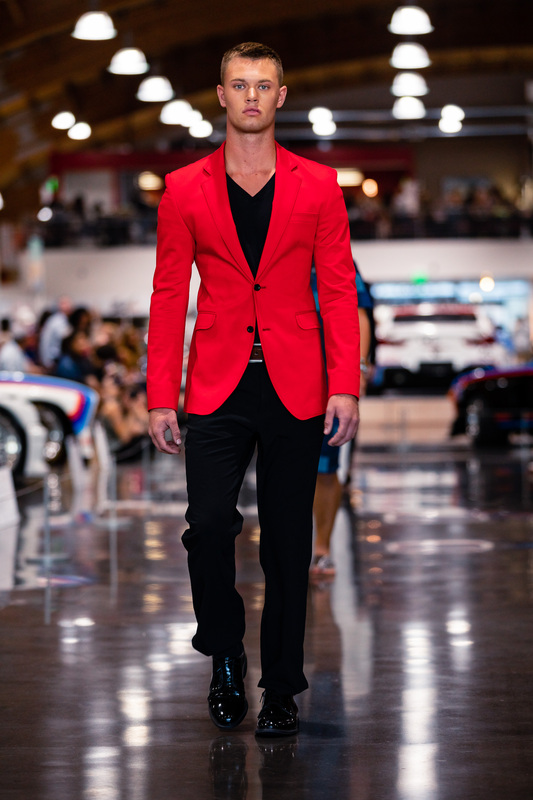 My favorite look was a tailored, bright-red blazer on top of a pair of black pants and a black t-shirt. This look, even though it’s very simple, exuded elegance down the runway, and the bold color also speaks about his ability to take some risks even with such minimal design. The cut was perfect, and it talked about all the human workhours that probably went behind the fit of this garment. I was really surprised by how clean and sleek these designs were, and I expect to hear more about this Oregon brand in the near future. After a short break, the show went on with our fourth designer in line, Heidi Fish Swimwear with accessories provided by Lunaversoul. In these types of shows, I always ask myself how much design can you show with something as minimal as swimwear, and every once in a while I do get surprised by some interesting colors and materials. This show was no exception, since Heidi Fish Swimwear delighted us with some beautifully designed full body swimsuits in luxe fabrics that looked just like velvet and suede, and lush colors that made us all crave for a nice vacation in the Caribbean. Once again the accessory work made by Lunaversoul really complimented each of the garments and pieces, with my favorite being a huge statement turquoise necklace with what seemed to be jade or some other beautiful green stone. It was an excellent runway overall and I was really pleased with seeing how varied the designs were, and how they appeased to different body shapes and skin tones. Last but not least, was the turn of Lisa Marie Couture to delight the audience with the final runway show of the day, along with accessory design by Namiko Abloom. It was a great idea from the producers of the show to end up the big spectacle with her, since she specializes in women’s night gowns. There were several show-stopping moments during this runway show. The first one came when a full, head-to-toe white Grecian gown came flowing down the runway in all of its regal glory. The accessories were on point too, donning a white handmade printed tear and headpiece that brought the whole look to a totally different level. It was like seeing a character from a Greek tragedy! Then the final showstopper was a lilac mermaid dress with a pearl necklace and another handmade printed tear. This dress was just beautifully executed and the model looked like a million bucks in it. Big congratulations to Lisa Marie Couture and Namiko Abloom for a wonderful journey to the past and present in such an avant-garde, yet dramatic and classic exhibition of grace. Well my friends, with that we concluded our recap of the Couture and Cars 2018 show. Which look was your favorite? Please let me know in the comments below. After the show, I stayed a little longer to chat with some of the designers and I also got to make some new friends during the mixer. Overall, I had an amazing time at this fascinating event and I can’t wait for next year’s show. This also marked the beginning of the summer/fall season of runway shows, so expect some other content here on the blog really soon (both New York Fashion Week and Bellevue Fashion Week are coming in September). I also want to give a big shoutout to Jared and Memphis Ribic for providing the photography work shown in this post, and to Antonio Smith and the rest of the Seattle Gents for attending with me and for taking the downtown Tacoma pictures. Next time, I’ll talk about our work with a friend’s non-profit that is changing the world through the means of clothing, so you need to keep posted to the blog and social media to read everything about it. I’ll leave you for now, not before reminding you to be stylish and to let your voice be heard. See you in a couple of weeks with more style and of course more fashion. Till the next! Socks and Accessories Wolf Clothing Co.